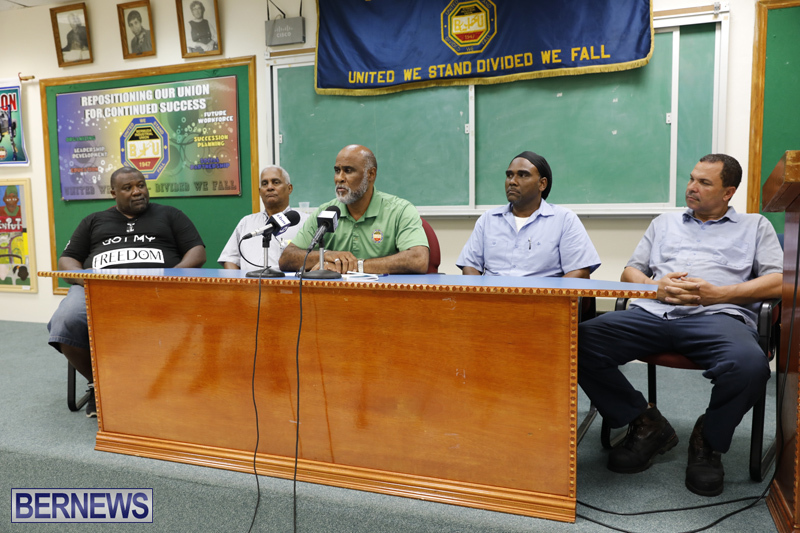 BIU President Chris Furbert is holding a press conference this afternoon [June 19] regarding the situation with bus service, which follows after bus drivers decided to ‘work to rule’ which resulted in no bus service during Monday’s public holiday. Mr Furbert previously told Bernews that the bus operators started work to rule last Friday and, as a part of that, on holidays, holiday schedules mean DPT has to ask for volunteers to work. The BIU President explained that bus operators have 10 to 12 issues that need resolving, and last Thursday they were able to negotiate on a few of those issues to a satisfactory manner, but there still are six to eight issues that need to be sorted out. “One of these issues go back several years now, and the workers have had enough,” Mr Furbert said. He added the workers want to know when the issues will be addressed. We will have additional coverage later on, and in the meantime the live video of the press conference is below. Update: Mr Furbert said they have a meeting scheduled with management this afternoon, and the workers are seeking a time frame when the issues will be addressed, with the issues including “unfair practices with the collective bargaining agreement,” conditions of the buses and depots, “staff issues not resolved in a timely manner” and more. Privatize public transportation or make it an essential service. Public transport is a 365 days a year service. There should be no asking employees to work. If they don’t want a job that has the likelihood of working holidays/weekends, they need to look elsewhere for employment. The OBA and, by the looks of it, PLP are too scared to tackle this issue. But how many more summers are we going to let visitors be stranded and have our reputation tarnished. The BIU is doing little to move us forward. They never think of the island as a whole when they work to rule or outright strike. They are only concerned about their members. It’s disgusting. Wait, why isn’t public transport an essential service? Because politicians in Bermuda don’t use public transport. The Gov’t has continued to drop the ball all these years by not financing their depts. , trucks and supplies properly. Whole departments have none of their fleet on the road. All down for long-term repair. Some Gov’t facilities’ working conditions are sub-standard with Buildings crumbling and rat infestations. I don’t blame the Bus operators at all . I know how pathetic Gov’t runs. I need the bus to! the next bus came way to late should be getting refunds or credit because the pass is invalid when the bus defaults. 175 bus runs cancelled last Friday, Gov’t needs big-time help! I Want My MONEY BACK! I am DISGUSTED!!! Been Tollerated this Way To Long! The government has tried for 18 years to change the bus schedule to save money. The bus drivers have always rejected it. It’s the bus driver’s fault. You are 100% correct! Privatize it and send these people packing! Let them march if they want! Too late to complain once their jobs are gone! Transport is essential to Tourism and kids and elderly so get behind it PLP! Perhaps the members should fire their upper management team for being poor negotiators. I mean really we have all heard Chris Furbert speak right? How the heck can you have a normal conversation with that? Furbert runs this country. No Burt. 4:000bikes…sounds like selfishness to me if nobody stops and gives you a lift work!!!! Aren’t we tired of hearing his crap. Let’s face it, BIU run this country, not PLP. “We’ve gone back to slavery”? Oh how melodramatic Mr. Furbert. Nobody ever said that the workers do not have right to suspend overtime. I never heard anyone say that. As per usual Mr. Furbert, you get in the news media and make all kind of Straw Man arguments. Minister Brown is saying that the industrial action is illegal because he published a “Notice of Declaration of Labour Dispute” in the Official Gazette on Thursday June 14th and the industrial action taken by the BIU occurred on June 18 which was AFTER the official notice was published. Therefore, according to the LAW Mr. Furbert, any industrial action that takes place after that official notice was published…..is ILLEGAL! Why are you misleading your membership like this??? PLP = OBA! If there is no difference in the PLP and the OBA, the PLP is going to be in big trouble. OBA delivered, they simply lacked on communication. They can thank Bob Richards largely for their demise. How ironic is that? Privatize Privatize Privatize when that happens there will be no reason to call the union. The biggest win will be regular bus service every day. Imagine that. Get cracking all you unionized drivers new ones waiting to take your job. Why don’t you take the cars away from the big shots and let them catch a bus for a few weeks. Maybe they need to sweat while waiting,watching and walking to their destinations. Let them walk in the shoes of the folks that NEED TRANSPORTATION! The Queen made $100mil last year and the royal wedding $$$$$$$$$$$$$$$$. Hey! Send some here!! How on earth you ask for new buses if your sitting making no income with your work to rule? Teach also your operators how to handle these buses like its the money coming out their own pockets. A bunch of smash and go paddle pushers. No regard for the equipment they operate. Act like yo own it. I thought the PLP way was to keep repairing the old buses forever, not ever to buy new ones. That was your strategy with the airport, wasn’t it? I do understand that the union has “issues” with the DPT. that’s the nature of this biz. what I don’t understand is , that Mr. Furbert is not able or willing to solve then all in one. in every country this is possible , why not by you Mr. Furbert? seems that he always left “issues” behind in order to organize more wild cat strikes. Where is Tweed and company. Notice we do not hear from him and his followers now that PLP are the party of the day. Just amazes me how silent on one the biggest trouble makers on this island is. Him and Glenn Simmons are the perfect pair. Nothing but TROUBLE both of them.